Lee breaks down US foreign intervention and how a developing nation can avoid being the target of a US-led operation to free a country of its valuable resources. Over the last week a political drama unfolded in Venezuela as a political leader from a right-wing party declared himself interim-President a day after speaking to US Vice President Mike Pence on the phone. Since this attempted power-grab US officials have revealed that the goal of this operation is to gain control of Venezuelan oil. Venezuela has the world’s largest proven oil reserves. After Libya and Ukraine, it is Venezuela. US President Donald Trump’s endorsement of Venezuela’s National Assembly President Juan Guaido as the country’s legitimate president follows a pattern in US foreign policy whereby leaders not readily pliable to American corporate interests get replaced in a popular “revolution” generously sponsored and minutely directed from Washington. UPDATE: Facebook restored the page for Venezuela Analysis roughly five hours after unpublishing it, offering no explanation. Facebook has removed the page of yet another media outlet. This time, it’s not a far right fringe network like Infowars, but “Venezuela’s only independent, grassroots leftwing English media platform,” the outlet, Venezuela Analysis, noted on Twitter. Due to cross-posting there may be some duplication. 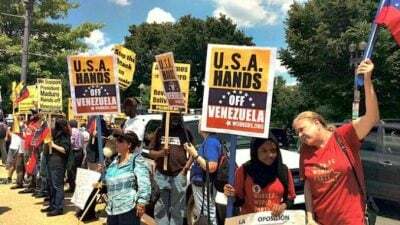 A lot has happened and we have learned more since last week when we wrote, Venezuela: What Activists Need To Know About The US-Led Coup. This article updates activists so we remain well-informed and can educate others in the face of a bi-partisan and corporate media narrative supporting the coup. Trump’s decision to unilaterally withdraw from the Intermediate-Range Nuclear Forces Treaty (INF) is now back in the spotlight as the main players of the Russian side (President Vladimir Putin, Foreign Minister Sergei Lavrov and Defence Minister Sergei Shoigu) have met and openly discussed the issue. The publicity of the discussion leads one to believe that there is a lot of message sending (to Washington, the media etc.) going on at this meeting which begs thorough analysis in order to understand what the reaction from Moscow actually is and what important points can be read between the lines. Now that the government shutdown has ended, the Trump administration has turned to hard science to bolster its argument for a border wall. The proposed 2,000-mile barrier, which would bar thousands of Latin Americans from illegal entry into the United States, received timely support today, with the announcement of a breakthrough scientific discovery. According to top anthropologists at Immigration and Customs Enforcement, only United States citizens – unique among any other people on planet Earth – possess qualities identifying them as true Homo sapiens. Boris Johnson, the leading Brexiteer and former foreign secretary, spoke last month at an event organised by Lord Bamford, the billionaire chief executive of earth moving equipment manufacturer JCB. Johnson reportedly earned £10,000 for his grovelling speech, littered with droll references to JCB’s products. On January 23 US Vice President Pence sent a message via Twitter that Washington recognized the 35-year-old Speaker of the Venezuela National Assembly, Juan Guaido, as the “legitimate” President of the troubled country, and not elected President Maduro. The fact that it was first Pence and not the US President, who seemed forced to play catch-up, says much about the intervention. The question is whether oil was the reason as neo-con Security Council adviser John Bolton claimed or something else. The evidence suggests something else, but what something? Bullies are at their most depraved when they claim to be the victim. The global bully, the land of the free to attack the world, USA, has never tired of portraying itself as the victim in all cases. For these American (North) imperialists, the alphabet begins with b and numerals with 2. The a and the 1 is hidden behind a smokescreen prepared by its vile media, because a and 1, the initiating steps has always been prepared or carried out by the US itself. For close on a hundred years the US has been the home of reaction, intent on crushing progressive and exciting forces throughout the world, anything daring to challenge its hegemonic grip on this planet.